WBA super flyweight interim champion Nonito “The Filipino Flash” Donaire will see action on the WBO featherweight title fight between Juan Manuel “Juanma” Lopez and Filipino challenger Bernabe Concepcion on July 10 in Puerto Rico. When we asked Top Rank promoter Bob Arum whether Donaire would be among the Filipinos featured on the fight card to be telecast “live” in the Philippines by the giant broadcast network ABS-CBN, Arum replied “absolutely.” Also seeing action on the fight card will be another Pinoy boxing sensation Eden Sonsona who will battle veteran Mexican world title challenger Genaro Garcia. Arum said they had submitted the names of four possible opponents which included three top Mexicans and one Puerto Rican to Showtime which will cover the big pay-per-view card . Arum said they would have a hand in choosing the most attractive and worthy opponent for “The Filipino Flash,” the former IBF/IBO flyweight champion who won the belts with a spectacular 5th round stoppage of reigning WBC/WBA champion Vic Darchinyan. 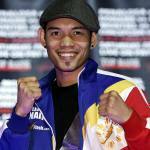 Donaire was elated when he heard the news from us. He said “I will definitely train hard for this fight” indicating that it means so much to him now that he is in the top rungs of the Ring Magazine pound-for-pound list behind the king, Manny Pacquiao. Before we told him about our conversation with Arum, Donaire said he was “training just in case” he would fight on July 10. He said he felt “pretty good” after sparring four rounds with Dodie Boy Penalosa Jr last Monday and said he would spar again on Friday. Donaire disclosed that he currently weighs 132 pounds which means he would have to work hard to make the 115 pound limit prior to moving up to 118 since he is having problems of making the super flyweight limit. At the same time he said former amateur standout Dodie Boy Penalosa Jr, son of former two division world champion Dodie Boy Penalosa was “training hard and doing really well” in preparation for his US debut on June 19 on a fight card headlined by former US Olympian Andre Ward, a good friend of Donaire.